Today I released Emergent Mind Project #6, The Evolution of Color. This is my first original project (!) 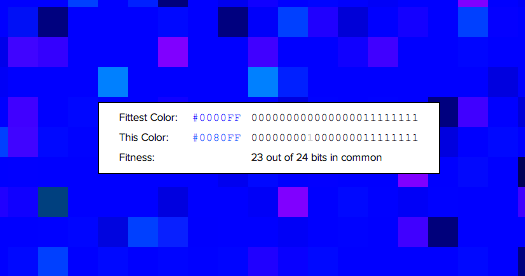 and it uses genetic algorithms to evolve a population of colors towards a fittest color (which you choose) and lets you observe how the fitness of the population evolves over time. If that’s confusing, don’t worry, it will hopefully make a little bit more sense when you see it. You can check it out here: Emergent Mind: The Evolution of Color. 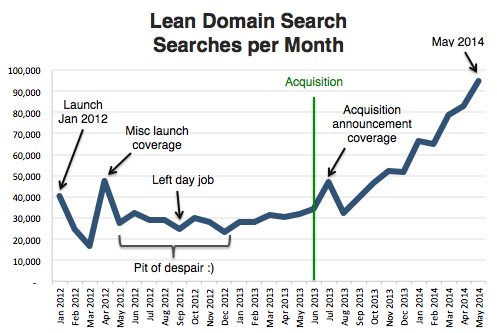 One year ago today, Automattic, the company behind WordPress.com, acquired my small startup, Lean Domain Search. I’m happy to report that Lean Domain Search’s monthly search volume has exploded over the last year going from 31,000 searches in May 2013 to more than 95,000 searches in May 2014. Despite the fact that we’ve haven’t done much work on it in the last year (we’ve been focused heavily on improving domain search and registration on WordPress.com), Lean Domain Search’s traffic is 3x what it was a year ago. Not bad right? First, before we announced the acquisition I made Lean Domain Search completely free to use. Prior to that you could perform a search but you would only be shown a limited number of results unless you paid for a premium plan: 150 search results for free, $79 for two months of full access (5,000 search results) or $199 for full access year-round. With no restrictions in place, Lean Domain Search became a lot more useful for non paying users which made folks more likely to perform multiple searches. Second, with the help of Ashish and Barry on Automattic’s Systems Team, we moved Lean Domain Search’s search server over to Automattic’s infrastructure, giving it a nice performance boost. Today it generates all 5,000 search results in about 1.25 seconds on average. Third, becoming an Automattic product definitely didn’t hurt things. While we don’t go out of our way to advertise it, the new ownership does add a certain amount of legitimacy to it that I think has helped it spread. PS: Interested in making the web a better place? We’re hiring.